Protect yourself by confirming your email address. We’ll email you every time you make a payment so you always know what’s going on. No credit or debit card? No problem! Top up your PayPal account to shop online card-free. Everything you need is right there in your account. Customise your profile just the way you want it – notifications, credit cards, mobile quick checkout and more. It’s quick and easy to reset your password. Simply enter the email address linked to your PayPal account and we'll send you further instructions. Top-up is a PayPal feature that allows you to transfer money from your bank account* to your PayPal account. It's an additional way for you to pay for online purchases more securely using PayPal – even without a credit card. *Note: Top-up is enabled with all banks in Singapore, except UOB, at present. How to top up my PayPal balance? Choose the bank you want to top-up from. Funds transferred using your bank account from DBS or POSB Bank will be made available in 1 to 2 business days. Funds transferred from other Singapore banks will be made available in 4 to 6 business days. Learn more. 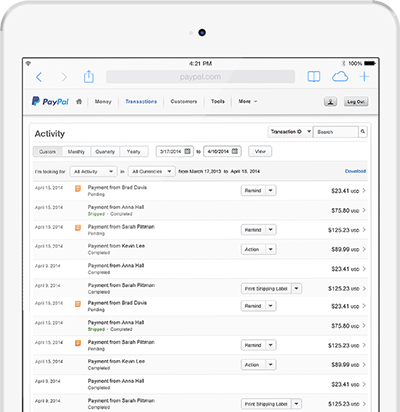 PayPal helps protect your bank account by keeping your financial information confidential. As an additional security measure, we will send you an email to notify you whenever you make a transaction with this bank account. To avoid withdrawal failures and return fees, the name on your PayPal account must match the name on your bank account. If the names don’t match, submit a request to change the name on your PayPal account. Learn more.